After breakfast, we packed up our bags, loaded in the van, and got to know our tour mates as we set out toward Mombacho Volcano Nature Reserve. From Managua, located on the western side of Nicaragua and about 36 miles or so inland from the coast, the Reserve was located about 35 miles to the southeast and just south of Granada. Despite being on the highway, it took at least an hour to get to the protected area due to sharing the road with horse drawn carts and industrial trucks. On our drive, we passed shanties, farms, markets and more. In order to reach the top of Mombacho, an extinct stratovolcano, we piled into a large, open air army truck that carried us up a road made of pavers. The summit that stands at 1,344 meters, offers two hiking trails. One hiking trail is considered difficult with 45 degree inclines and declines over the two mile trek that wends through a dwarf forest. The other trail, which is the one we followed, circled around the main crater through a cloud forest. 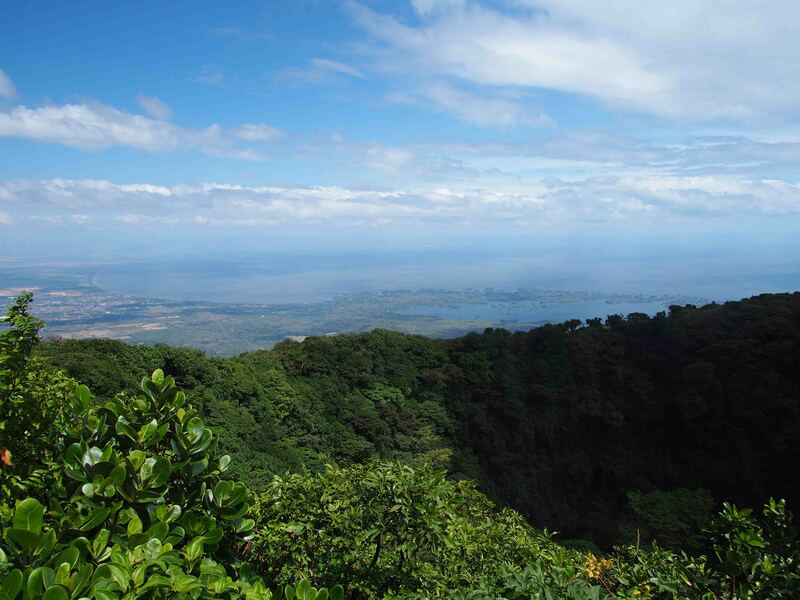 We descended a wet, tree trunk path beneath a canopy of trees to an open area which offered a lovely view of Granada and the Isletas of Lake Nicaragua. Near the windy overlooks, water vapor rose from round holes. Red lava rock crunched beneath our feet as we continued along the rim and between two walls, stopping to admire the lush vegetation blanketing the crater. The moist, mossy forest is home to jaguars, howler monkeys, and sloths just to name a few interesting animals as well as all sorts of flowers, in particular vermillion and orchids. The vermillion flowers are important to the forest as they can hold up to a liter of water, and its leaves provide food to the monkeys. In addition, the red eyed frogs use it for their home. After about a 1.5 hour stroll through the forest, we reached our idling vehicle at the summit which we took half way down the hill to a zipline canopy tour which took place in a coffee plantation. We zoomed from platform to platform above coffee plants while we braked with our glove covered hands. After five or so ziplines, we “tightrope walked” while clipped in to a wire above us that we also clinged to with our hands. After the tight rope, we swung on a Tarzan rope and continued the normal zipline until our final 45 foot free fall. It was an enjoyable time, despite earning a rope burn upon my final descent. After waiting for cars to share the single lane road, we finally ventured down to the parking area where our driver took us in the van to Granada. We drove past a horse wandering through the road, a few pigs who also felt the road might be better than a pen, and even a funeral procession that was quite fascinating with a see-through hearse followed by friends and family walking on foot to the cemetery. Granada, with a population of 125,000 has a storied past. It was founded in 1524 by Cordoba, a Spanish conquistador and was the first European city on the American mainland. It was subject to many invasions from English, French and Dutch pirates who were trying to take control of Nicaragua, and was once set ablaze by the American filibuster William Walker’s general which destroyed much of the ancient city. Granada and Leon argued over which was the capital city until Managua was created between them. The colonial city is a colorful place, home to refurbished buildings as well as dilapidated ones. We wandered through the busy square and along a few side streets until we fell upon a mostly pedestrian street lined with restaurants. This was definitely the tourist area. As we strolled, we watched kids in costumes dance for tips, we scoped out the Paroquia de Guadalupe toward the end of the populated area, and eventually circled back toward the square to settle on a restaurant for happy hour, El Tercer Ojo. The zen-like restaurant projected an old movie on a neighboring wall, offered cheap drinks, and tasty food. Later, we enjoyed dinner at Restaurant El Zaguan which was located on a quiet street behind the square’s cathedral. It offered fantastic traditional fare, including the Churrasco and was completely full on Sunday night. I loved it. Previous Post My First Two Days in Nicaragua!